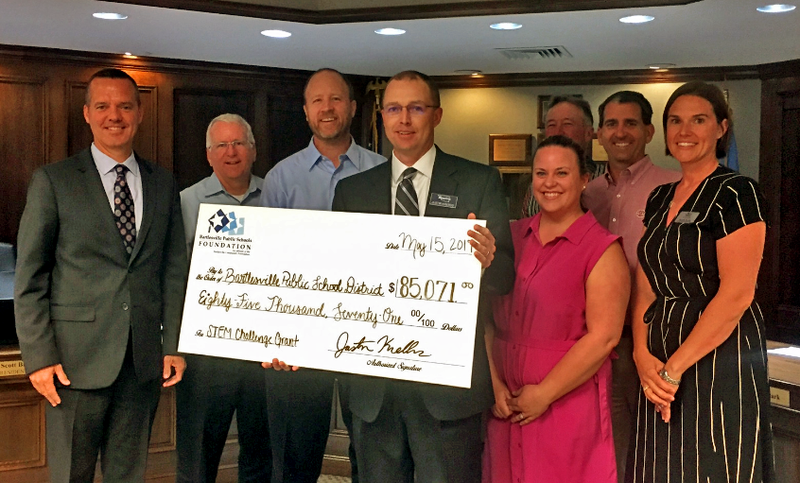 Officers from the Bartlesville Public Schools Foundation presented a check for $85,017 to the Bartlesville Board of Education at its meeting on Monday, May 15, 2017. 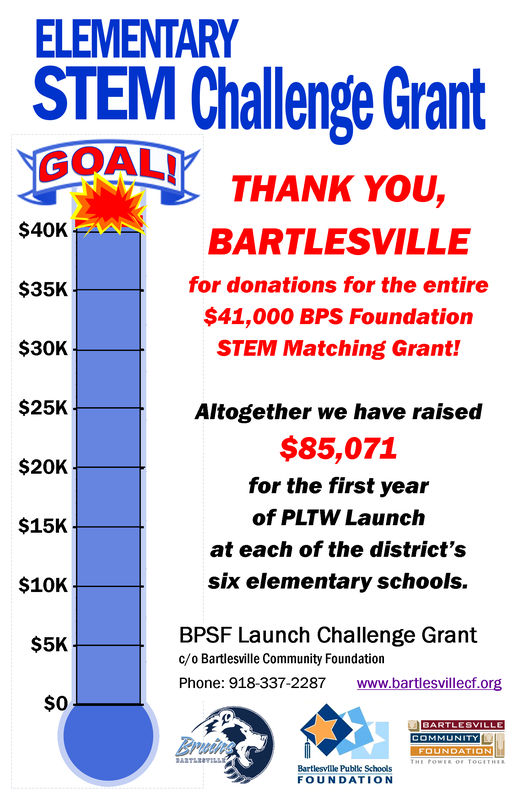 The check was the product of a successful Challenge Grant for piloting a new STEM program in the Bartlesville school district’s six elementary schools, and was presented by three Foundation officers: Chairman Justin Krebbs, Executive Director Blair Ellis, and Secretary Jessica Birk. Six months earlier, the Foundation announced it would match up to $41,000 in community donations to pilot the Project Lead the Way Launch STEM program in the district’s elementary schools. The Foundation exceeded its goal, and the funding will offset much of the cost for the first year of offering a STEM Computer Science module in all of the district’s elementary school classes. The district’s teachers have embraced the new program. Only the fourth and fifth grade classes were required to pilot new STEM modules in 2017-2018, but all of the teachers in kindergarten through third grades also volunteered to pilot modules tailored to their students. Therefore, next school year the district will be offering a computer science pathway from kindergarten through high school via the new Launch modules in each elementary class, Gateway to Technology courses in both middle schools, and three different computer science courses at the high school. Since 2015, Bartlesville Public Schools has been expanding its STEM (Science, Technology, Engineering, and Mathematics) program. A $1.7 million grant from Phillips 66 funded the construction and equipment for Phillips 66 Innovation Labs at each secondary school, and the BPS Foundation grant builds on that by extending STEM curricula into each elementary school. The district plans to add additional STEM modules at each elementary grade level in future years until four modules are taught annually in every classroom.